Here at Suffolk Copier Systems, we are dedicated to taking care of your business with professional, honest and friendly service. We go the extra mile with every job and as a result, our customers recommend us to colleagues and business associates again and again. We want to earn your business. We support our customers with affordable prices on equipment, parts, toner, or service and repair. Suffolk Copier Systems can provide you with new or used fax machines, copiers or printers, and we understand that no two customers are the same. What does your business need? 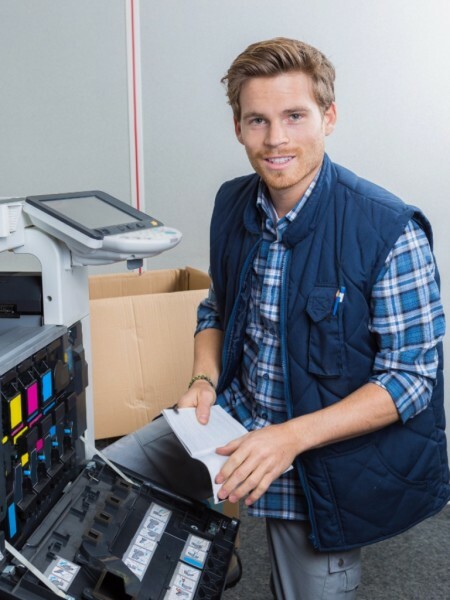 We can set you up with a large multifunction machine or a compact photocopier. In addition, we have a full selection of color copiers, as well as basic black and white machines. We definitely understand that price is important and we have equipment to fit every budget along with options for buying, leasing and renting. We service Canon, HP, Kyocera, Copystar, Lexmark, Xerox, Toshiba, Muratec, Sharp, Konica-Minolta, Ricoh and most other business and enterprise level equipment. We carry both OEM and compatible cartridges for most brands. We come to you! Whether you're in Suffolk County, Nassau County, Queens, the North Fork, the South Fork or Shelter Island, we will be there to keep your business up and running. Do we have customers near you? You bet! We sell and service laser printers, wide format printers, plotters and most other business and enterprise level printers. We sell and service most makes and models of copy machines as well as sell both OEM and compatible consumable equipment. We sell and service all major fax brands including Brother, Epson, HP, Canon, Muratec, Xerox, and more. We offer competitive yearly service contract options on printers, faxes, scanners, copiers, shredders, and more. Since not all problems can be properly solved at the initial time of service, we carry a number of loaner equipment options for your business. Suffolk Copier Systems will strive to meet your service or equipment needs in the fastest manner possible. We sell and service Swingline, Shredmaster, GBC, Fellows and other major shredder brands. We will work with you or your IT department to best integrate your new equipment into your network.